Visit fairy tale castles and cultural capitals on a river cruise with the AmaSerena. This thoroughly modern river boat offers romantic journeys along Europe's most popular rivers. 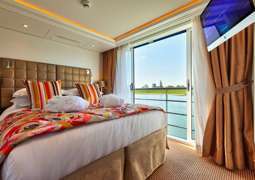 The AmaSerena offers popular river cruises on major rivers in Europe. She sails the Danube, the Rhine, the Main and Moselle, drifting along scenic routes at a relaxed pace. She sails through major European capitals such as Amsterdam, Vienna and Budapest, but also past lesser-known gems like picturesque Bavarian villages and stunning hilltop castles. See the best of Europe and visit a different city every day, all without ever packing your suitcase because your hotel room travels with you. A river cruise is one of the best ways to see Europe's top destinations in a low-stress, cost-effective manner. The AmaSerena herself offers the latest in comfort and style. 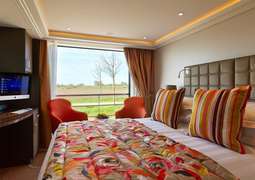 Launched in 2015, she is one of AmaWaterways' newest ships, meaning she's equipped with the latest modern comforts. Staterooms are equipped with twin balconies, one French, one full, an innovative way to offer more flexibility in cruising as well as maximize space. The ship features an expanded range of onboard activity options, including a top-deck pool with a swim-up bar. Choose the AmaSerena to experience the absolute latest in modern river cruising. 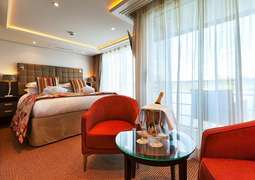 The AmaSerena's staterooms are spacious and comfortable, with every stateroom featuring a view to the river and most containing dual balconies. Bright décor and modern furnishings give the rooms a contemporary flair, and guests will appreciate the attention to detail that will make their experience all the more comfortable: reading lamps above the bed, sound-absorbing paneling on the walls, and extra storage space under the bed are all small details that make a big difference. Top-category staterooms and suites additionally feature a larger sitting area, a larger bed, and a bathtub in the bathroom. The dining on the AmaSerena is exquisite, and the cuisine often reflects the areas the ship is traveling through. Expect goulash in Hungary, bratwurst in Bavaria and schnitzel in Vienna, as well as more classic dishes such as Caesar salad, roast chicken breast and a wide variety of soups. The chefs prepare an excellent ever-changing menu, and guests are frequently presented with surprise snacks or an amouse-bouche from the kitchen. Though AmaWaterways focuses heavily on destination-oriented cruising, there are plenty of activities on board the AmaSerena to keep passengers happily entertained, from departure to arrival. The sun-deck pool is the perfect way to soak in the scenery as you soak up the sun, watching castles and villages drift by with a cocktail in your hand. For cool-weather cruises, the panoramic windows in the ship's main lounge provide an equally-stunning view of the local landscape. A massage and hair salon provide the perfect way to relax after a long day exploring a city, and if the shore excursions don't provide enough exercise for you, a fitness room and a walking track on board certainly will. AmaWaterways has a casual dress code, and passengers are encouraged to dress comfortably according to the weather and the day's activities. In the evenings at dinner, a smart-casual or resort-casual dress code reigns. Be sure to bring one nice outfit for the Captain's Dinner, which typically occurs once per cruise.